Innovation hub Sensor City in Liverpool has announced the winners of its fast-track growth competition. The 10 winning SMEs, which are located across the UK, are Beverston Engineering Ltd, MM Sensors Ltd, Wearable Link Ltd, Real Space Ltd, K-Safe Ltd, Envirowatch Ltd, Hexagon Scientific Ltd, CSols Ltd, GeDaP and iSensing Ltd. The companies will now embark on a six-month programme worth up to £10,000 designed to boost their competitive advantage and innovative capabilities to drive growth. This will include taking up hot desking and co-working space within Sensor City in Liverpool, with access to its specialist laboratories, in addition to enrolment on the AWS Activate programme which will provide them with the technology infrastructure, technical training and business support they need to grow. The successful SMEs come from a diverse range of sectors, including engineering, transport and logistics, environmental monitoring and wearable technology, yet are all working on sensor and Internet of Things solutions for their particular industry challenges. Based in Knowsley, Beverston is a manufacturer of state-of-the-art engineering components for industries including aerospace, oil and gas and pharmaceutical. With plans to use the package to open doors to collaborative opportunities and create a smart manufacturing factory, the company was recognised by the judges for its eagerness to adopt digital technologies. MM Sensors is a start-up firm developing a new sensor technology for measuring meteorology, tide and wave conditions to aid the design of coastal defences. The judges praised MM Sensors for its plans to use the package to accelerate the development of its innovative microbuoy, which is set to have a significant impact on the maritime sector. Wearable Link is an innovative start-up providing life-saving safety solutions for construction, healthcare and sport markets. Having been recognised for its history of delivering innovative products, the company will use the programme’s laboratory access to refine its latest product, while using AWS to develop its online platform. Immersive start-up Real Space is developing a ‘single reality’ optical headset for the manufacturing industry by using VR software to increase the vision of the user and reduce eye strain. Through the programme, Real Space plans to use Sensor City’s specialist laboratories to develop its wearable sensors further, as well as opening doors to new markets and job creation. K-Safe founded the world’s first safety app for cyclists and motorcyclists that predicts, detects and analyses road accidents. The support from Sensor City and AWS will allow the company to adopt additional analytic and machine learning services, applicable to other hazardous environments. South Shields-based Envirowatch pioneers sensors that identify which sources are polluting different areas so that targeted and effective mitigation measures can be put in place. With a strong trading position already established, Envirowatch was praised by judges for its plans to leverage the programme to make a positive impact on the smart cities agenda. Based in Liverpool, Hexagon Scientific develops and manufactures a range of sensors and systems to assess contaminants in air and liquid. Having identified a niche opportunity for a holistic approach to improve environmental monitoring, the company will use the support to bring its products to market faster. Runcorn firm CSols develops laboratory software solutions to improve efficiency and reduce costs. 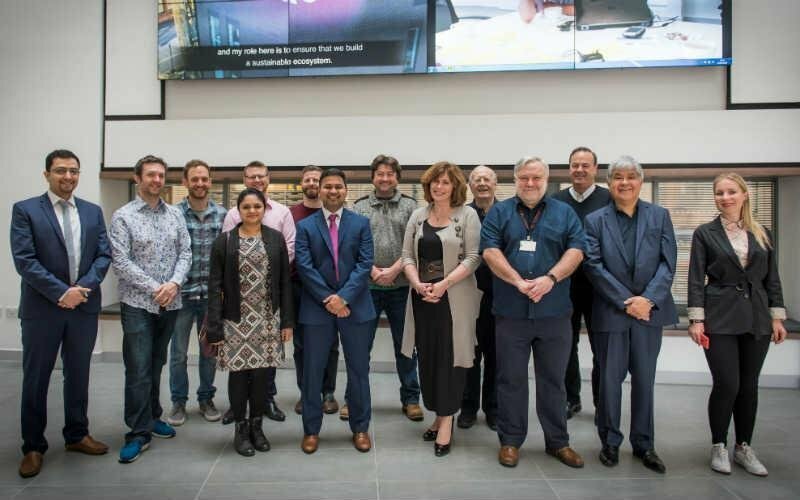 With the potential to make a huge impact on a global scale, CSols will use the programme to enhance its work with Professor Andy Cooper’s acclaimed initiative ‘The Chemical Lab of the Future’ at the new University of Liverpool’s Materials Innovation Factory. Wirral-based cyber security firm GeDaP provides specialist consultancy and software to protect documents and data. Impressing the judges with its market knowledge, GeDaP will use the expertise to create a standardised approach to Internet of Things (IoT) security. iSensing, based in Belfast, creates and deploys sensor networks to capture real-time movement data of people in cities. To maximise on the opportunity the programme presents, the company will use the expertise on offer to build the next version of its innovative platform using machine learning to automate data feeds and output.